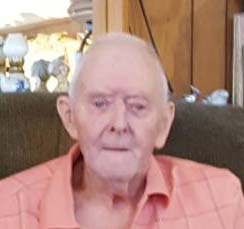 Beverly James “Jack” Broaddus, aged 86, of Pekin, IL was surrounded by his loving family when he went to be with the Lord on March 15, 2019 at 5:38 p.m. He was born on March 11, 1933 in Eaton, Ohio to the late Beverly Scott Broaddus and Florence Connell Broaddus. Jack worked at Caterpillar, Inc. and retired from Peoria Disposal Company. In his retirement he enjoyed traveling the country with his wife, fishing, and watching baseball, football, and NASCAR. He was an avid Chicago Cubs and Chicago Bears fan. His favorite snacks were his chocolate chip cookies and peanut butter crackers. Jack’s family will always remember his unique personality. When he was younger, he enjoyed racing his purple stock car #136 at Peoria Speedway. He had a tremendous sense of humor. Jack loved playing jokes on the family, including hiding his wife’s food when she would leave the table. He also had a collection of moose stuffed animals that would travel the country with him, and they would “wave” to the truckers as they drove by. When the family would show up to visit and knock on the door, they would always be greeted with a loving “Go Away!”. He is survived by his wife of 43 years, Gwendolyn Broaddus of Pekin; daughters Kaylyne Osborn and husband Billy of Pekin, Denise Janak and husband Joe of El Campo, TX, Lori Friend of Henry, and Susan Miller and husband Ray of Campbell, CA. ; sister Francis Griffth; grandchildren Darren and Tracy Lottos, Jerimey and Adriana Grider, Jasen and Krystal Grider, Katie and Travis Dale, David Ritchie and Tara Barron, Donald Ritchie and Kim Moreno, Angela Janak and Matthew Pfeiffer, Jamie Donaldson, Michael Donaldson, Alisha and Joe Brownfield, Matthew Mansfield, and Chad Mansfield; and 20 great-grandchildren. The family would like to express their gratitude to the nurses on the 4thfloor at Pekin Hospital and the Compassus Hospice & Palliative nurses for their wonderful and loving care of Jack. Cremation rights have been accorded and no services have been scheduled. To share a memory or send a condolence for his family, visit www.peoriafuneral.com.